Playing without pain – for both touring pros and weekend warriors- is my #1 goal when treating golfers. 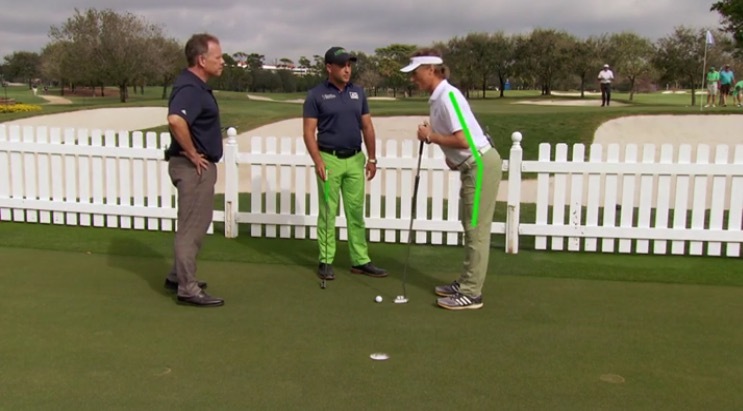 Did you know that Berhard Langer’s former putting issue was attributed to spinal posture? What if you could stay out of pain during 18-36 holes AND play better? We will be hosting a live putting clinic with Eric Kaplan AT the office in Aventura this summer! Email Info@DrDoman.com for more info as spaces will be limited. Eric Kaplan, founder of the Four Secret Body Locks and AXYS Golf, teaches both Bernhard Langer, Miguel Angel Jimenez, and Miami Sports Chiropractic & Yoga Center patients how to play a better, more consistent game and remain pain-free. His method is endorsed by leaders in golf biomechanics and yips researchers at the Mayo Clinic! For a free video lesson click here for a Golf Channel segment featuring rising star golf professional, Eric Kaplan, and Berhard Langer, winner of yesterday’s Regions Tradition. Want to join us this summer for the putting clinic?